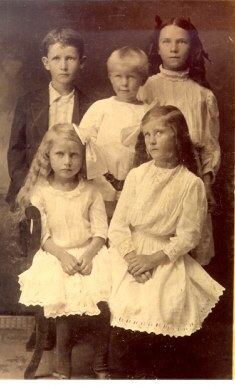 The picture to the right was made in Circa in 1912 Back Row: Joe Munkus, Ward Munkus, Ether Munkus Front Row: Ollie Munkus, Dea Munkus These are the children of Beverly Clinton Munkus, from his first family. I have this picture thanks to June Weddle. I hope soon to put a picture of B.C. with this one. You might ask why he gets his own page, WHAT'S SO GREAT ABOUT B.C. MUNKUS??? Here it is. At the tender age of 9, our hero Beverly Clinton (one must wonder if he remembered his name correctly,leaving home and family so young) was sent by his father .....to find his brother Joe's KILLER! What a hard man! Poor B.C. never returned home, and until recently, no one in the family knew of his descendents or him. June is supposed to be supplementing this story for me with more details, so watch for more info! To see where B.C. falls into my family, check the Family Tree! To email June Weddle, who is descended from B.C. her email address is JuneBugDJE@aol.com I am waiting on an update from June on this story, there seems to be another story from his other family about how he came to leave home. I will post it as soon as I get it!